If you're in the market for a brand-new smartphone--or if you feel that you haven’t fully taken advantage of your current one--finding great apps is the last piece of the puzzle. The sheer number of apps available on the market can be daunting, but our package of essentials should be more than enough to get you started. In this article we've assembled the top software for Android phones; if you have a different mobile OS, be sure to see our picks for BlackBerry, iOS, or Windows Phone 7. Our list is selective: Apps such as those for Amazon, Facebook, and Google Maps aren’t included here, because if your phone didn’t come preloaded with those, you’ve probably already downloaded them. The apps we did choose to list are intended to expand the functionality of your smartphone and make tasks easier, faster, more secure, and even more fun. You may even discover a few items in this collection that you simply can’t live without. You can easily find the following apps by searching in the Android Market. You'll need to have an account there, and the apps may cost a dollar or two. Before you buy, read the minimum requirements for each app to confirm that it will run on your phone. Remember that downloading apps counts against your monthly data-usage limit. And for the latest app reviews, be sure to visit our Android AppGuide. Beluga The easy-to-use Beluga group text service allows friends to join conversations, coordinate activities, and update their locations on a map, making this app a perfect tool for organizing group gatherings in new places. Imo Have tons of friends? 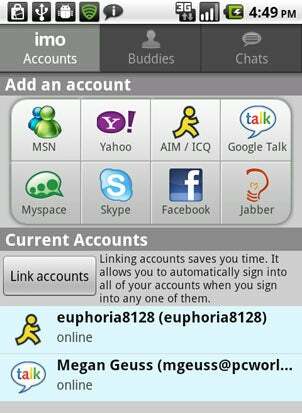 Do they all use different instant messaging services? No problem: Imo eliminates the hassle by allowing you to sign in to the most popular instant messengers all at the same time. Bump Pass information easily from one smartphone to another with Bump. When two devices both running the app are physically "bumped" together, the selected content transfers over, even if one is an iPhone and the other is an Android-based handset. Dropbox If you use Dropbox on your desktop PC, you already know that it's the easiest way to sync files across multiple systems. With Dropbox for your mobile device, you can quickly move files from your PC to your phone without having to plug your handset into the computer. Gmote Through this app, you can move the cursor on your PC or Mac by using the phone's touchscreen. It's the perfect way to open or close windows on your desktop or laptop computer when it's sitting across the room. Lookout Mobile Security More than just antivirus software for your phone, Lookout allows you to back up your de­­vice to its servers; you can even use it to locate your lost or stolen phone. Lookout keeps your phone safe from malware, as well, scanning apps as they install to your phone, and constantly updating itself so that it can block new threats. Springpad With Springpad you can create to-do lists, and set reminders for yourself to increase your productivity. In addition, you can "bookmark" books, movies, or other items that have yet to be released so that you can remember to buy them later. Pulse One of the best-looking RSS readers out there, Pulse even imports Google Reader feeds so you don't have to build the mobile reader from scratch. 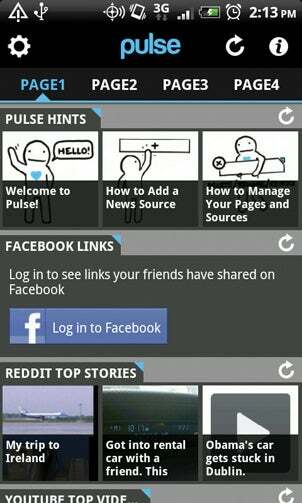 You can separate feeds by category, and post interesting stories to Facebook or Twitter from the app. Taptu An aggregated newsreader that looks great and is easy to use, Taptu allows you to pick and choose which news items to read, as well as to mark interesting stories for later. The app works well even in areas with bad reception, so you can almost always get to your news. AccuWeather Unlike the Weather Channel app, AccuWeather lets you manually refresh the screen to update weather data on demand. The app also boasts a GPS feature that permits you to check the forecast for a spot on the map that you don't have a name for--very practical if you are out traveling or camping. WeatherBug Elite Look to this app for local meteorological stats such as temperature, humidity, barometric pressure, and wind speed. It also provides radar maps, pollen conditions, and forecast videos. Weather Channel The most trusted name in weather updates has an easy-to-use app. Weather news refreshes every time you move between screens, and weather tips and trivia can help you pass the time if you happen to be caught in a storm. 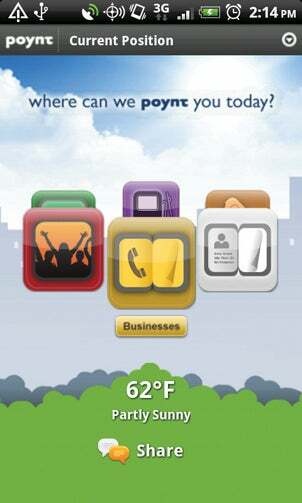 Poynt If you're exploring a new town and you want to know what establishments are close to your location, Poynt is the perfect app for you. It can find nearby businesses, restaurants, gas stations, and even people and events. The app will provide basic weather info about your current location, as well. Urbanspoon If you're visiting an unfamiliar city and don't know where to eat, give Urbanspoon's slot machine a whirl: It'll choose a place for you. And if you already know where you want to dine out, you can quickly reserve a table through the app and obtain directions to the restaurant. Waze Hate sitting around in traffic? Turn to Waze for help. You can see where traffic is at a standstill, and the app can reroute you to bypass the mess if possible. Maps update in real time, so you'll be able to see traffic jams right as they begin to form. The app does use your phone's GPS, so keep an eye on the battery level to make sure it doesn't run dry. Google Music The new Google Music service may be in beta right now, but it is by far the best and easiest way to get all of your music on your Android phone. Using the Google Music desktop client, you can upload all of your music files and playlists to Google's cloud storage. Then, with the Google Music app for Android, you can stream all of your stored music directly to your handset. A word of warning, though: Streaming a lot of music to your phone can burn through your data plan like crazy, so be sure to use a Wi-Fi connection instead, whenever possible. Netflix Just grab some popcorn and settle in: Now you can watch David Bowie's Labyrinth (or other guilty pleasures) on the bus, in the airport, or anywhere, over and over again! Note that streaming is available on select versions of Android only. Pandora When it comes to Internet radio, Pandora is the leader. The app helps you discover new music by creating radio stations based on your favorite artists or songs, and it homes in on your tastes by learning from the thumbs-ups and thumbs-downs that you assign to the songs it selects. PicSay Pro Don't just snap pictures, have fun with them. Take a photo and insert speech bubbles, swap heads and bodies, and apply filter effects. Shazam When you hear a song and you just have to know who the artist is, Shazam saves the day. It will "listen" to the song for a minute and then deliver surprisingly accurate results--it works even if your musical tastes are a little eccentric. 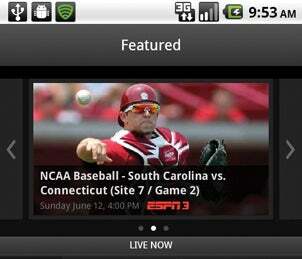 WatchESPN Devoted sports fans never want to miss a game, of course, but sometimes life simply gets in the way. No longer: Check with your TV provider to see if you can access ESPN's live video-streaming app, and let the games begin. Words With Friends Move over, Scrabble: Words With Friends is the new word-game champion. In the game, you build words for points, and challenge your friends to see who has the biggest vocabulary.